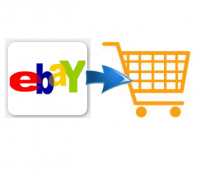 "eBay orders export" add-on is specially developed for CS-Cart based online stores. This add-on allows to export the information about products sold through eBay into your CS-Cart admin panel. Exported orders appear on the orders page in CS-Cart admin panel (Orders -> View orders). "eBay orders export" is a must-have add-on for online store owners who sell products both through eBay and through the CS-Cart based online store because it allows to trace and manage orders in one place and control the number of products in stock. The number of products in stock are automatically reduced. it is necessary to choose the shipping method of an eBay order from the selectbox on a corresponding shipping method editing page in CS-Cart admin panel (Shipping and taxes -> Shipping methods -> Edit shipping method). The add-on is compatible with CS-Cart Professional 2.2.4 and 3.0.x. 3. Please read the Documentation (click the Documentation tab on this page) to learn how to use the add-on. Please, contact us, if you have any questions about this module. What eBay information do i need? 3. Save your DevID, AppID, CertId to some file. then click "Generate Token" and enter your eBay account details. 5. Save your Token to some file. DevID - enter your DevID which you got from eBay. AppID - enter your AppID which you got from eBay. CertID - enter your CertID which you got from eBay. AppToken - enter your Token which you got from eBay. eBay region - choose a country which is used as your region at eBay. According to this setting the list of available eBay shipping methods will be generated on a shipping editing page. Cron key (only latin letters and numbers allowed) - enter any letter and number combination, it's necessary for a security reason. Export period (30 days - max) - all eBay orders that were either created or modified within this period (enter the number of days, i.e, 1) will be returned in your admin panel (after clicking "eBay update" button in Orders -> View orders). Orders to export - choose what kind of eBay orders you would like to get exported. - Only marked as paid except PayPal - only those orders that are marked by a eBay customer as paid excluding orders paid via PayPal will be exported to CS-Cart. Exclude shipped orders - this setting allows to exclude the eBay orders that have a shipped status from exporting to CS-Cart. Choose "Yes" if you want to exclude shipped orders (default) or "No" if you want to receive orders that have a shipped status. Order status - choose the order status for your eBay orders which will appear in CS-Cart admin (Processed, Completed or Custom). If "Custom" is chosen, orders will get a status which is specified in the Status letter field below. Status letter (if order status "Custom" selected) - allows to assign any status to the order exported from eBay. In order to find the Status letter, it is necessary to go to Orders -> Order statuses -> Edit the necessary status (Add status first if you don't have it already created). Status letter is specified in the field "Status". Where to specify the eBay product title in CS-Cart? It is necessary to specify the eBay product title because only in this case an order will be exported successfully. Please go to Products -> Products. Choose the product which you sell at eBay and click "Edit". On product editing page go to "Add-ons" tab . In the field "eBay title" type in the name of a product as it is stated at eBay. An order exported from eBay will contain the name of the product used in CS-Cart. Where to specify the eBay shipping method in CS-Cart? It is necessary to specify the eBay shipping method because only in this case an order will be exported successfully. Please go to Shipping and taxes -> Shipping methods. Choose a corresponding shipping method and click "Edit". In the eBay shipping method selectbox (General tab) choose a shipping method used at eBay. An order exported from eBay will contain the name of the shipping method used in CS-Cart. How can I start the eBay orders export? 1. Log into your CS-Cart admin panel and go to Orders -> View orders. 2. To start exporting orders from eBay click "eBay update" button in the top right corner. Note! Export may take several seconds. 3. If there are orders from eBay for a period specified in the add-on settings (Export period), they will appear on the orders page with an eBay icon. Can I set up a cron job for the automatic export? In order to export eBay orders automatically, you can set up a cron job to trigger the script on your server. Please contact your hosting provider to learn how to set up a cron job. Please make sure your real time zone agrees with the time zone chosen in your admin panel. Log into your CS-Cart admin panel and go to Settings -> Appearance -> Common settings to check up your time zone. 1. Download the archive with the Ebay orders export add-on. This hook adds an eBay icon next to the eBay order on the orders page. 4. In the list of add-ons find the Ebay orders export add-on and click Install opposite to its name. 5. Click Edit (CS-Cart 2) or settings (CS-Cart 3) to edit the add-on settings (click the Documentation tab on this page for more details). "This tool has save me so much time and has allowed me to integrate my ebay orders into my website administration system so i can easily print invoices and manage all orders from one location. The Alt-Team were very helpful in helping me get the application running when i had some hosting provider issues. Thank you Alt-Team"